Determining used golf cart values is an important step before purchasing or selling a used golf cart. Buying a used gas or electric golf cart can save a person several thousands of dollars. Likewise determining the fair market value of your golf cart when selling can mean the difference of several hundreds of dollars. Unlike a car, the age of the golf cart is not as important. With a lot less moving parts, what is important is how well the golf cart has been maintained. While looking to replace my 1987 Club Car, I found that it was in much better shape than several late 1990 carts I looked at. Used golf cart prices are not found in the same way you'd look for used car values. There is no Kelly Blue Book for golf carts. So you are on your own and you have to do some homework to figure out the value of the used carts you are looking at. To determine a price for your used golf cart, find out what other carts are selling for that are the same make, model, and year (or close to it). Compare the condition of your golf cart -especially the age of your batteries to the other carts. Maybe you are trying to sell your used Yamaha golf cart and want to know what price to set. 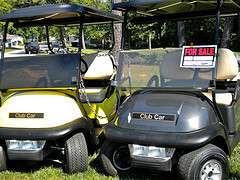 Or maybe you are wanting to buy a used Club Car golf cart from your neighbor and want to know if it's a fair price. Get a good idea of used golf cart prices. Look at all the makes and pay attention to the year of the cart, how old the batteries are and how it was used. Refine your search to a geographical part of the city - such as the southeast or northwest. Local Facebook groups for your community sometimes allows people to post things for sale or join a local Facebook swap and shop group and find golf carts for sale there. Type in "used golf carts YOUR STATE or CITY"; i.e. 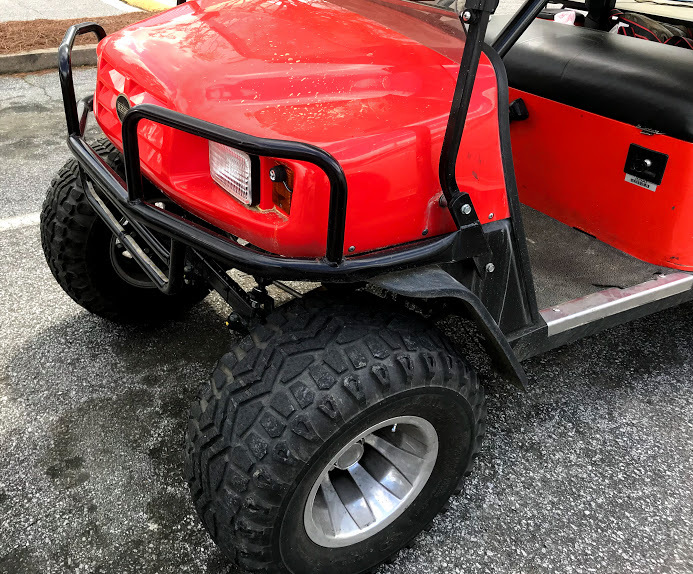 "used golf carts Peachtree City"
I looked at many used golf carts over a period of several months - even though I thought I wanted a Club Car I checked out lots of Yamaha and EZ Go carts as well before finally deciding on my 2006 Club Car. There are sites to visit on line, but you also need to find out where you can go to physically see them and test drive them. I wouldn't buy a golf cart without first examining the batteries, cables, tires, and body. It needs to be taken for a test drive as well to see how speedy it is, how well the brakes work and if there are any funny noises. 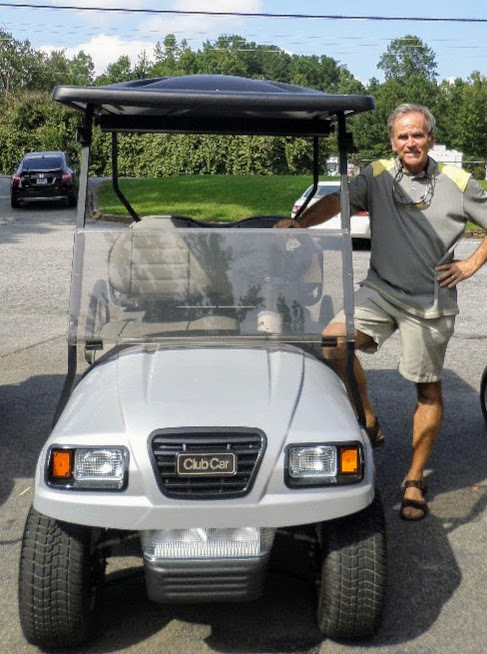 Living in a golf cart community provides the advantage of having many used golf cart dealers - our local golf cart businesses sell new golf carts as well as refurbished used golf carts. 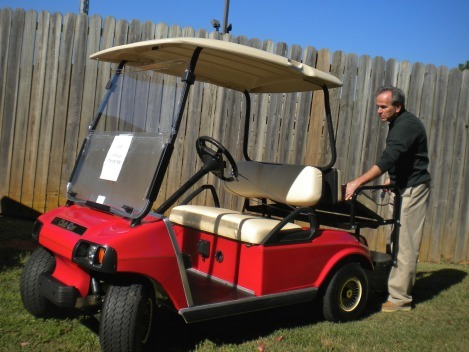 It is a great way to look at lots of used golf carts and to take them for test drives. There are some advantages of buying a used golf cart from a dealer. 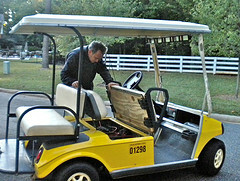 The refurbished golf carts will usually include new batteries, mirrors, headlights and tires. Many dealers also offer some type of warranty. So if you are looking to buy or sell a golf cart check out the used golf carts offered by local golf cart dealers. It can help you determine the value of your golf cart and provide you with a nice selection of used golf carts that are in good condition. 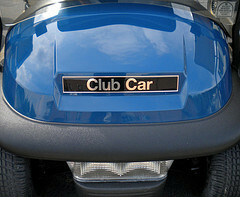 A dealer's used golf cart values will usually be higher than from a private individual. That's because these dealers often sell refurbished golf carts although they usually sell some "as is." Each dealer is a bit different, but usually the golf carts have new batteries and golf cart battery cables, new windshields, tires, and tops. The cart is thoroughly checked and cleaned so it operates and looks like new. 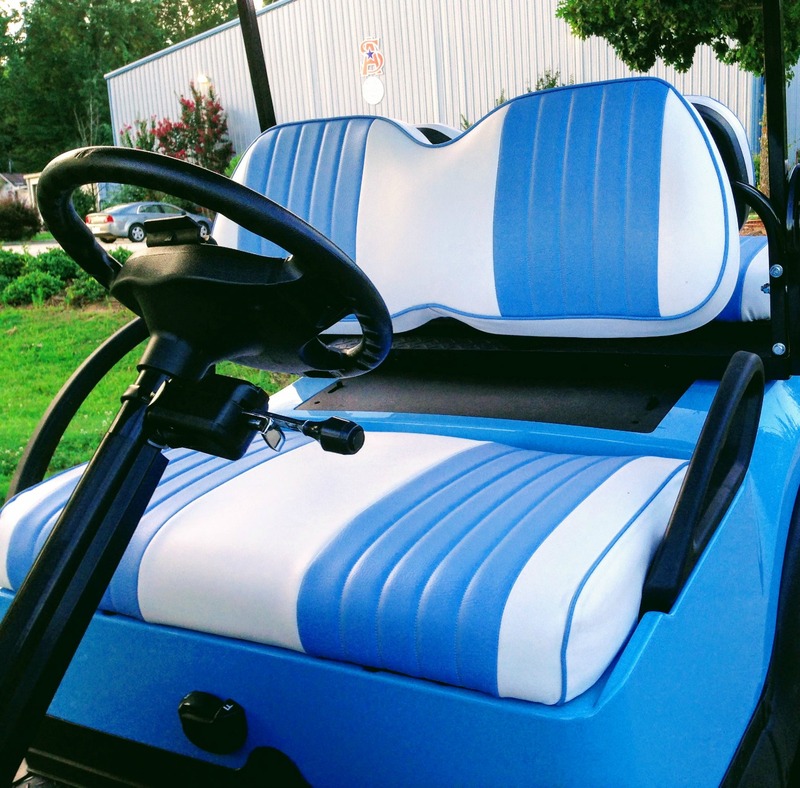 Some of the refurbished golf carts often come with a warranty. Find out what is the condition of the golf cart batteries. 1. What is the make? Are they Exide or Trojan golf cart batteries or discount golf cart batteries, like from Sam's Club. 2. How old are the batteries? Golf cart batteries typically last 4-6 years. If the batteries are 4-5 years old, you can expect to pay over $500 for a new set of batteries. So figure that into the cost of the golf cart. 3. What kind of golf cart battery maintenance was performed? Check to see if there is water covering the plates. Ask the owner if he maintained the golf cart or if it was serviced by a local golf cart dealer. 4. What is the voltage of the batteries? Check to see if 6 or 8 volt golf cart batteries are used in the cart. 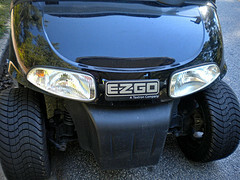 It's usually better to buy a well known and common named golf cart, like EZ Go, Yamaha or Club Car. Parts will be easier to find and golf cart repair will be less expensive. 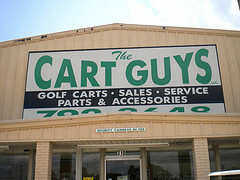 When it comes time to sell your golf cart, a well respected name will make it easier to sell. Was it used daily, weekends only, or just in the summer. Ask how long have they owned the golf cart, what repairs or modifications have been made, such as new motor, a speed chip or new rear struts. One big factor in determining used golf cart values is how many people does it seat? Is it a 2 seat or a 4 seat golf cart. You can add a rear seat if you find a 2 seat golf cart that you like. However, a rear seat kit costs around $400 plus the cost of a heavy-duty rear leaf spring kit to support the suspension. Check the condition of the seats and look for tears and staining. Has the cart been left outside or is it garaged. While searching for a new used golf cart myself, the carts that were left outside have seats that are in the worst condition with lots of black mold, stains and fading. If the cart has a rear seat does it include an extended top? Check the condition of the used golf cart tires. Be sure to check all 4 tires. I've found many used golf carts where two of the tires are in good shape and the other two need replacing. New standard golf cart tires cost around $50-$60 to replace. Check to see if the tread is evenly worn and how much tread is left. 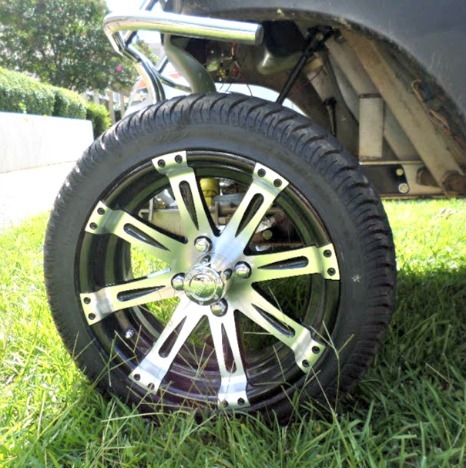 Custom golf cart wheels and tires can really increase used golf cart values. You may or may not care about these custom wheels, but you can be sure that they did cost the owner some serious money. Many golf carts have just ordinary golf cart wheel covers which won't affect the price of the used golf cart. What condition is the golf cart body? When was it last painted? Are there any scratches or dents that need to be repaired? The last used golf cart I looked at had a bent frame while others have had lots of marks and scratches. I'm ready to start looking at refurbished golf carts at our local used golf cart dealers. These dealers refurbish not only the batteries and cables, but often will put on a new golf cart body. You can often find that they provided good used golf cart values. Golf cart accessories can affect used golf cart values. Find out what accessories are included. Does it have a golf cart windshield? 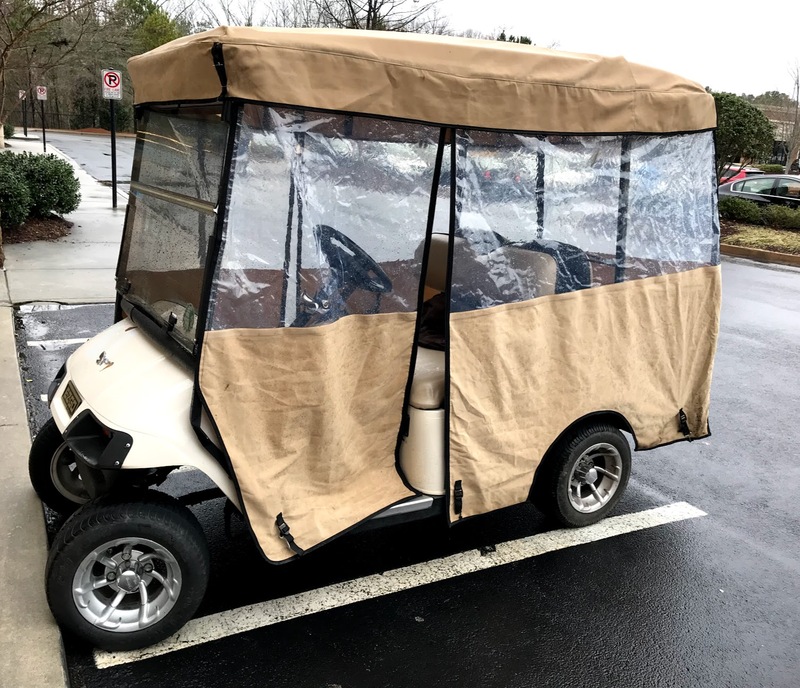 If it includes a golf cart enclosure is it a standard universal beige color or a custom Sunbrella enclosure? Check to see it has working headlights and tail lights. Is there are rear view mirror, storage basket, speakers or a golf cart radio? Are there any custom features like a golf cart custom paint job or custom body. List each of these factors, then you can compare prices and determine for yourself reasonable used golf cart values. See which used golf cart gives you the cart that is in the best condition, has the newest batteries, has been well maintained, and includes the most accessories. Once you find the used golf cart that has the most features you are looking for and you have a ball park figure of what's it's worth, make the buyer an offer. Buying a used golf cart can be a smart move if you know what to look for and what to ask the golf cart owner. List your golf cart for free on Craig's list or post a picture and description on any community boards in your town. Our Kroger stores always have several used golf carts for sale posted. Join a local Facebook swap and shop group to list it. Go from Used Golf Cart Values to Golf Cart's Etc.